Growing up, my friends and I had a little service every week in the chapel before going to Sunday school, and we always sang lots of hymns. "Jesus Loves Me" was popular. So were "I sing a song of the saints of God," "Go tell it on the mountain," and "For the beauty of the earth." But whenever the Sunday school teacher would ask us for a request, the number one hymn pick was always "Onward, Christian Soldiers." We loved to sing it while marching vigorously in place. Now, we don't sing that song too much anymore. The military imagery for Christians has gone quite out of fashion in mainline churches. We don't like to think of faith like being "soldiers" who are "marching, as to war." But military imagery is in no short supply throughout the bible. This Sunday we'll hear Paul commending the Ephesians to put on the whole armor of God - to stand and fasten on the belt of truth, the breastplate of righteousness, the shield of faith, the helmet of salvation, and the sword of the Spirit, which is the word of God. This is in order to "quench all the flaming arrows of the evil one." I have a soft spot for the Christian soldiers song from my childhood, and I've also always loved Paul's passage on the armor of God. I love the idea of God's truth, righteousness, faith, salvation and Spirit somehow draping over my body so as to protect me as I navigate the world. This armor of God is not like putting on an impenetrable shell - like when King Saul put his own formidable suit of battle armor on young David as he was preparing to confront Goliath. 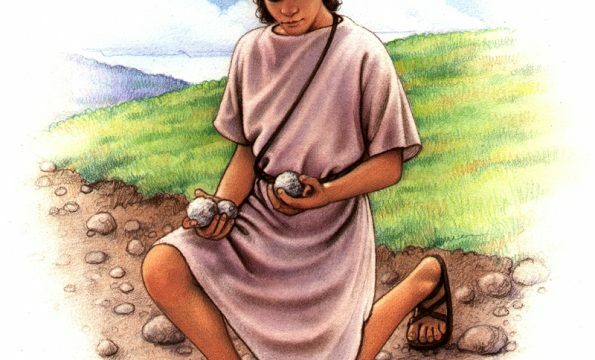 Unlike Saul's armor, God's armor is more like when David sheds that heavy protective gear and rejects the use of Saul's menacing weapons to meet Goliath just as he was, wearing only his shepherd's skins and carrying only 5 small smooth stones and his little slingshot. Rather than putting up defenses, putting on God's armor is like stripping down to honest vulnerability - allowing our trust to be in God's strength instead of our own. Each of us experience the flaming arrows of the evil one differently in this life, but some of those arrows always seem to come our way, and there seem to be many such arrows flying all around us these days. We need to be strong in the Lord and in the strength of God's power, putting on the belt of truth, the breastplate of righteousness, the shield of faith, the helmet of salvation, and the sword of the Spirit, which is the word of God. We need to trust in something much bigger than any of us. This Sunday's readings are HERE. Note that in Ordinary Time, we're following "Track 2"